We returned from an excellent vacation week in the Outer Banks on Sunday. Great weather, great time. Being away from the shop for a week was killing me though, so Monday I spent quite a bit of time in the shop (with my great wife keeping our kids busy). 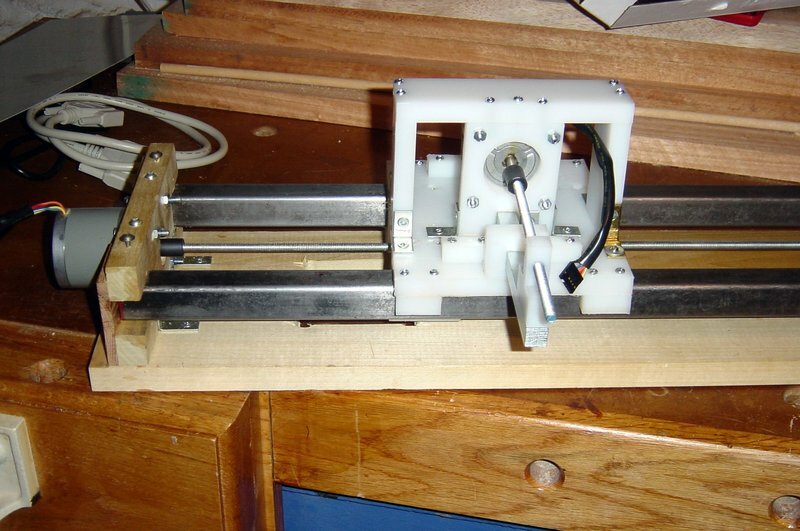 I virtually completed the physical construction of the CNC-Lathe attachment. 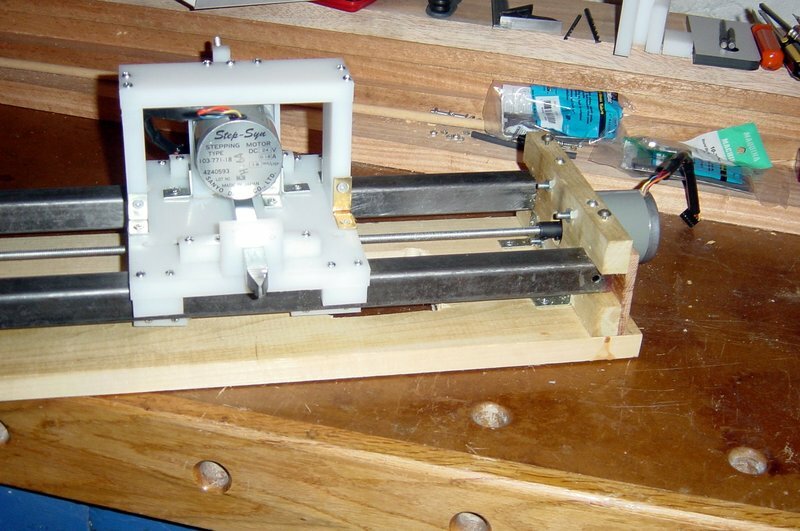 I mounted the 2nd stepper motor and built the cutter-head assembly out of UHMW plastic. The cutter itself is made from 1/2″-square steel stock. It will have a small screw-on carbide cutter insert shortly. I also modified John K’s design slightly for the 2nd stepper-motor mount. The UHMW plastic that I have been using was flexing too much for my liking, so I built a UHMW box around the original motor-mount to provide more lateral strength. Probably unnecessary, but I tend to overbuild things! The only work left to do on the physical construction of the machine is to make the chip-guard for the carriage and add the carbide insert. Both simple tasks. Next steps are to wire the stepper-motors to the controller board, and the board to a power-supply and an old PC….then get the software working. I am going to use an old PC that has been in storage in the basement for a few years as the navigation system for the CNC machine. Therefore, the first task will be to bring the old junker PC back to life…I hope to work on that in the next couple of days. After that, we should be ready for power-on and see if this thing will cut wood! Posted on September 27, 2005, in CNC, Travel. Bookmark the permalink. Comments Off on Back from the beach and CNC-machine nears completion.